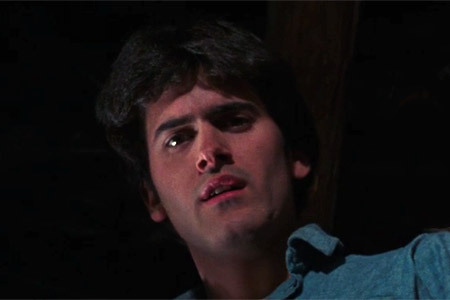 In the first Evil Dead our awkward, dim-witted hero Ash hasn't become the brash harden badass he's known for. He's pretty weak and helpless when it comes to danger and fending for himself while only suriving on pure luck. Ash’s sister and the odd woman out in the group. Typically she is the first to sense the danger surrounding the cabin and is entirely ingnored by her friends after she returns to cabin after being attacked by the woods. Ash’s girlfriend and a bit on the slow side of things. She is very much in love with Ash and keeps a necklace he gave her close to her at all times. She is stabbed in the ankle by Evil Cheryl and is unable to be moved out of the cabin. Scotty’s girlfriend and probably the least developed character in the film. After Cheryl is possessed Shelly retreats back to her room where she is possessed by the Evil. Soon after she viciously attacks Scotty who has no choice but to stab and dismember her. Good looking, cocky and a bit of a clown, Scotty holds his own fairly well until he is forced to kill Shelly who became possessed by the Evil. Cheryl turns into Evil Cheryl while recovering from her encounter with the evil in the forest. Linda turns into Evil Linda after she gets infected by the evil while recovering from being stabbed in the ankle by Evil Cheryl. Shelly turns into Evil Shelly after being rushed by the evil while changing in her room. Scotty becomes Evil Scotty after he returns injured from trying to find an escape in the woods.